Princess Diana of the Amazons is a strong, healthy character. As Wonder Woman, she is one of the world’s most famous superheroes, and she is the most famous female among them – some argue the most famous heroine of any kind.1 Superheroes tend to embody the hope that individuals who step up to do the right thing can make the world better. Wonder Woman goes further by demonstrating hope that every individual can improve. She wants to help people discover the best in their own true natures. Diana’s magic lasso, known for compelling people to speak honestly, represents her dedication to truth itself. Why put together a book on the psychology of a superhero who’s mentally healthy and whose enemies are not widely known? When I wrote Batman and Psychology: A Dark and Stormy Knight, people understood why: The Dark Knight has serious issues, his enemies fill an asylum, and no superhero has foes more famous than his. Using psychology to look at those characters and stories seemed the obvious thing to do, and mining that fiction for examples to explain psychology made sense. Personal trauma does not drive Diana to become a hero. Real-life heroes’ backgrounds tend not to include a single driving tragedy.2 As comic book writer Len Wein observed, “Some of them become heroes because it’s simply the right thing to do.”3 There are many kinds of heroes, though, and many areas of psychology. Not all of them are dark. Truth is incomplete when we seek it only in the darkness. Hunting for secrets in the dark of night, no matter how many great discoveries that might reveal, falls short and even misleads us if we overlook other truths that shine in the light of day. A look at mental illness makes little sense unless we contrast it with mental health. How can we evaluate a person’s “impairment in social, occupational, or other important areas of functioning”4 without considering what counts as unimpaired functioning in the first place? How can we discuss “abnormal” without defining “normal”? Questions like these nagged at Wonder Woman’s creator. Why has she endured? Is it the strength of the name itself, Wonder Woman? Marston originally wanted to call her Suprema the Wonder Woman in the vein of Robin the Boy Wonder and many other characters of the time, but editor Sheldon Mayer disliked that and said to cut it down to Wonder Woman.35 She was not a direct spin-off of a male superhero (no more so than any other superhero ultimately derives from Superman, that is), not in the way that Hawkgirl, Supergirl, and Batgirl followed Hawkman, Superman, and Batman. Nor was she created to be a male superhero’s love interest (Hawkgirl, Bulletgirl), relative (Mary Marvel, Supergirl, She-Hulk), inspired fan (Batwoman, Batgirl), team token (Invisible Girl, Marvel Girl), or femme fatale (Catwoman – sometimes a hero, sometimes not). Among superheroes, she was the independent woman – woman, not girl. She may have joined the Justice Society initially to help out as their secretary, but in her own stories she was the hero. Depictions of her have varied, notably with regard to how violent she might be and how much fun she’s having. In her early adventures, she refuses to kill, she sports a good sense of humor, and she has fun throughout her adventures. Over the decades, she would undergo a number of revisions, partly because her roots in World War II no longer held up as the decades progressed but also because women’s roles and rights changed over time. We look at the strong, healthy character for some of the same reasons recent psychologists now charge psychology with a criticism her creator made long ago: Too much of psychology has focused on that which is abnormal without exploring that which is normal – hence Marston’s classic book, Emotions of Normal People. Whereas other psychologists and other fictional characters might view humankind pessimistically, William Moulton Marston and Wonder Woman look for the best in us all and hope for our world. In the twenty-first century, a psychologist best known for studying the causes and consequences of learned helplessness36 promotes positive psychology on the belief that psychology has overemphasized the worst parts of human nature to the neglect of trying to understand the best.37 Perhaps more than any other superhero, Princess Diana of Themyscira embodies the virtues that positive psychologists look for in us all (wisdom, courage, justice, temperance, transcendence, and humanity38), which the Virtue Files at the end of each section in this book will explore. She is a wonder. Behold. 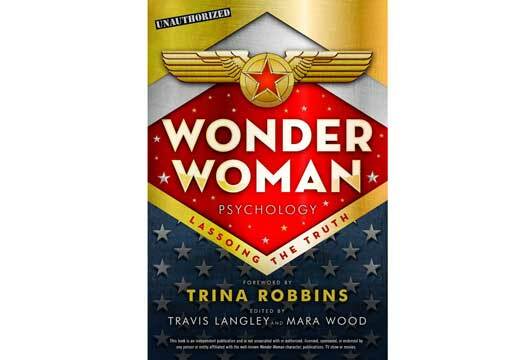 - Reprinted with permission from Wonder Woman Psychology © 2017 edited by Travis Langley, Sterling Publishing, RRP £9.99, Available online and at all good bookshops. See also an extract from one of the other books in the series, Doctor Who Psychology. 1. DC Comics (n.d.); Hanley (2014); Morrison (2011). 2. Allison & Goethals (2011). 3. Letamendi et al. (2011). 4. American Psychiatric Association (2013), p. 21. 7. New York Times (1993); Marston, P. (personal communication, 2016). 11. e.g., Bio Staff (2014). 12. Marston (1917) followed Benussi (1914). Larson in 1921 (described in 1932) and Keeler (1933) expanded the polygraph to multiple physiological channels. 13. Bunn (2012); Committee to Review the Scientific Evidence on the Polygraph (2003). 14. Frye v. United States (1923), cited in Fisher (2008). 15. Bunn (2012); Fisher (2008); Committee to Review the Scientific Evidence on the Polygraph (2003). 16. Meyer & Weaver (2006). 17. e.g., Sensation Comics #3 (1942); Wonder Woman #4 (1942). 20. Sensation Comics #6 (1942). 22. e.g., Sensation Comics #6 (1942). 24. Diaz (2016); Reynolds (1994). 25. Superman since Action Comics #1 (1938), Batman since Detective Comics #27 (1939), and Wonder Woman since 1941 except for a two-month hiatus between Wonder Woman #329 (1986) and The Legend of Wonder Woman #1 (1986), then five months between The Legend of Wonder Woman #4 (1986) and Wonder Woman #1 (1987). 26. Duncan & Smith (2009). 27. Langley (2012), p. 6. 28. Fantomah debuted in Jungle Comics #2 (1940), the Woman in Red debuted in Thrilling Comics #2, and others followed. See Fernandez (n.d.). and Madrid (2013) for more of Wonder Woman’s predecessors. 29. e.g., the original Captain Marvel, whose comics would outsell Superman’s: debuted in Whiz Comics #2 (1940). 30. Joyce (2008); Karlin (2016). 31. Quoted in Daniels (2004), pp. 22–23. 32. Richard (1940), p. 19. 33. Wonder Woman Rebirth #1 (2016). 34. Wonder Woman: The Circle (2008). 35. Mayer, C. (personal communication, 2016). 36. Seligman & Maier (1967); Seligman (1972). 37. Seligman (1998); Seligman et al. (2005). 38. Peterson & Seligman (2004).